As I sat down to lunch in the Redifer Dining Commons yesterday, I noticed something extremely interesting about my plate. It was piled high with hearty helpings of cauliflower and mixed steamed vegetables including peppers, lima beans, and broccoli. I was pretty impressed, considering 15 year old me would have opted for mashed potatoes and called it the daily veggie serving. This led me to ask myself a question I’ve always wondered about. Why do children resist eating vegetables? Is there scientific reasoning, or does the fault lie in the fact that parents constantly shoved vegetable baby food down their children’s throats? Following the motto of my initial post, I concluded that there has to be a scientific explanation for this stereotype. And it turns out that I was correct in my assumptions. There is a scientific explanation for child resistance of vegetables, and it known as food neophobia. Simply put, it’s defined as a child’s disinclination to eat food. But food neophobia isn’t the only reason young kids avoid their vegetables. According to this research review from Appetite, food neophobia coupled with picky eating make for the two biggest culprits in the childhood boycott against vegetables. A child’s age, gender, social surroundings, and personality can all affect her level of pickiness; furthermore, variables like pressure, parenting styles and feeding styles have an affect on how long a child experiences food neophobia or fussy eating. Even visual appeal plays a role in a child’s level of food neophobia; the more unfamiliar a food looks, the more likely a child is to reject it. The same excerpt from Appetite also presented an explanation for our growing tolerance of healthy food. When we are toddlers, our decreasing dependency on our parents increases our survival skills, one of which is the resistance of vegetables. Young taste buds are not developed enough to enjoy bitter foods, and instead react negatively towards the foods as a defense mechanism against what they think to be poison. 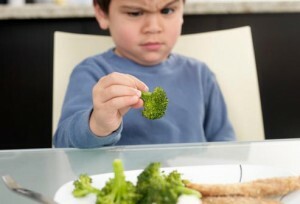 In short, young children NATURALLY spurn bitter foods like vegetables. However, as we grow and our senses develop, we adapt to the bitterness in most vegetables, which justifies why I can now stack my plate with all different shades of green, orange, yellow, and red. It seems as if picky eating and food neophobia are just two more things we can add to the list of “phases” our parents love to discuss. What I actually found most fascinating about my interest in this particular study was its relevance to our first class discussion with Andrew, that science is anti-authoritarian. No one forced me to research why kids dislike eating vegetables; I went about it on my own terms. I simply had a strong curiosity. The same goes for the scientists who researched food neophobia on their own volition. Like Andrew said, many believe science to be de-humanizing, when in fact it is a topic humans participate in and relate to the most. The semi-disappointing piece of this puzzle is the fact that there really is no particular way to ensure kids will willingly consume vegetables from their first go at eating solids. Luckily, the Washington Post has provided us all with a short list of ways to get kids to eat their vegetables, so if/when food neophobia strikes our households in the distant future, we have something small to fall back on! This entry was posted in Uncategorized on September 1, 2016 by Mary M. Brown. I really liked the way you started this article and the way it flowed overall. I am honestly trying to critique it but I cant find anything you forgot to mention. Maybe an experiment you decided to make up on your own. That would help make your statements more concrete. You still discussed the topic very well. You also tied this topic back with the fundamental concept of Science. Your links and everything you talked about really covered all aspect of neophobia. Especially the link about the ways you can get your kids to eat vegetables. That tied it together very well. It is interesting to see how many ways you can trick your kids. My neighbor was only 4 and she would never eat anything. Then they just started adding veggies to pizzas and blending them into soups and juices and she never knew. With the juices her mother would add loads and loads of spinach, a couple of berries, and you could honestly never even taste the spinach! Well done with the blog post! What an interesting topic to blog about! I’ve never thought too deeply about the reasoning behind kids’ dislike for many vegetables. I was a pretty open-minded eater as a kid, but recently I’ve been discovering foods that I never thought I liked growing up. For example, I’ve always despised avocados. I thought they were the slimiest most disgusting green item in the produce isle. This past year however, I suddenly saw avocados in a new light, and they are currently one of my favorite things to eat! (You should avocado with tortilla chips– like guac, but easier!) I’m definitely going to pay more attention to foods I didn’t think that I liked growing up, and maybe I’ll even give them a second chance! Here’s an article that talks about food mistakes that parents make with their kids–I found it really interesting! What a great idea for a blog! When I was little my parents would have to bribe me to eat my vegetables but now, I absolutely love them. I put kale and spinach in my morning smoothie and I could eat endless amounts of broccoli and green beans. I never thought there was a scientific explanation to this. It’s scary to think that these days, the food that kids are most familiar with are junk food so the more years that pass, the more kids become accustomed to junk, and unfamiliar with healthy foods. Maybe that is why we grow to like vegetables. Because we ourselves make the decision, and we all know how independent and stubborn teens can be. I have two younger sisters and my mom is always frustrated with them choosing chips over green beans. I explained your blog to her and she was grateful to finally have an explanation! She is going to try some of the tricks with the link you provided. Here is another enjoyable way for you to get your daily dosage of greens! This is a very interesting topic, I have never heard of food neophobia before, for I always have loved to eat vegetables an never really had a problem with them. I do however have a better liking now than before, but I never despised them. A cool thing to look into would be, since the presentation of the food and unappealing look has a lot to do with this hate for vegetables, what if we made delicious food like pizza look unappealing. Do you think that there would be a pizza strike? This may be a weird/dumb question but you have to wonder. Great blog post! I’m apart of a very picky family. My two younger brothers are probably the pickiest eaters I have ever met, greens being one of the things they avoid. I think it’s interesting that as a child’s dependency on their parents decreases, kids open up more to eating new things. I can’t say that my brothers have fully done that now that they are 13 and 15 years old but they definitely have increased their diet as their dependency on our parents have decreased. I absolutely despise veggies as I hang out in this never ending childlike state. I’ve done a lot of research on nutrition and I realize how important they really are for your health. I actually just had this conversation with not only myself but many of my friends that I usually eat with in hopes they would encourage me to get after those dang vegetables. I decided that sometime this week would be my turning point and I would finally enjoy my first salad. That’s the goal as sports seasons finally start into full swing. I am officially replacing all my creamery trips with salad bar trips. Wish me luck! This is an interesting topic to discuss about and I actually never thought about the reason behind this. I personally don’t like vegetables like most of the kids when I was young, but I never realised when is the turning point for me to start eating salad more often than anything else. I think it also involve habits. I mean when you get used to the taste of vegetables, you’ll eventually be fine with it.